Size of this preview: 800 × 424 pixels. Other resolutions: 320 × 170 pixels | 3,134 × 1,662 pixels. Description: Two Enigma rotors and the spindle on which they are mounted. 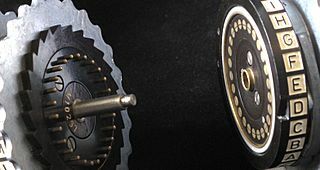 When the machine is assembled, the spring-loaded studs on the right hand side of rotor (pictured left), make electrical contact with the brass contacts on the left hand side of the rotor (pictured right). The rotor to the left shows the tooth-edged rachet of the stepping mechanism. 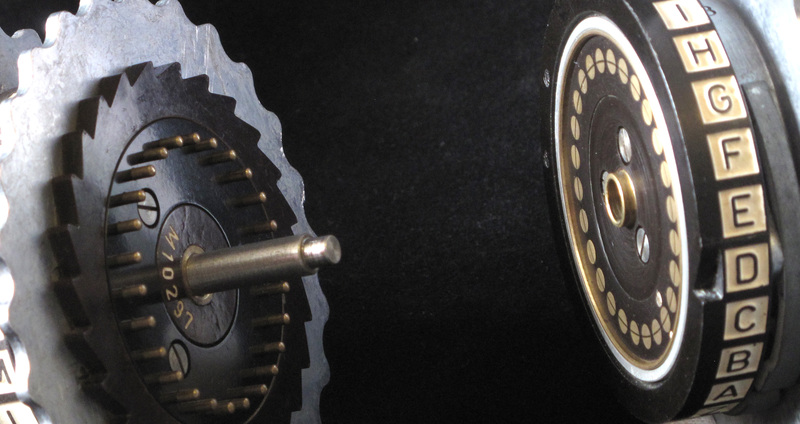 The notch adjacent to the letter 'D' on the rotor to the right, allows the pawl of the stepping mechanism to fall into place to advance the rotor to its left. This page was last modified on 21 April 2017, at 09:57.